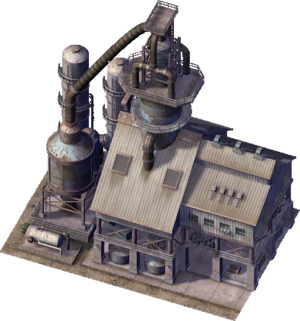 Broquard's Cement Plant is a Dirty Industrial Anchor Lot that grows on Medium and High density Industrial Zones. Anchor Lots are the first building grown by SimCity 4's Industrial Zones, designed to provide both a destination and spawn point for the game's traffic simulation. Due to this, they are the only Industrial buildings that require direct Transit Network access. Machinery Lots and Outbuildings are grown adjacent or near to the Anchor lot to expand the Anchor Lot's capabilities, as well as to allow industrial growth away from Transit Networks. When the Colossus Addon Mod is installed, all of the default lots are have their stages rebalanced and the number of jobs is increased to 248. It is otherwise unchanged. This page was last modified on 17 July 2014, at 16:10.